Find accommodation Bucuresti with EastComfort. We have more than 50 quality apartments in Bucuresti, sorted by price, number of guests or by our recommendations. View our list of apartments and choose one. Our Last Minute Today ! 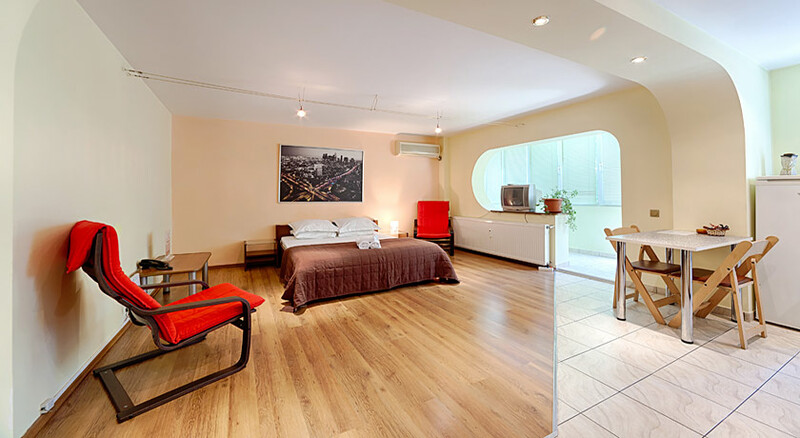 In order to get cheap accommodation in Bucuresti, you have to rent this wide studio apartment, due to its large windows and the ceiling light-spots, creates a warm atmosphere. Highly furnished, the studio comprises a night corner (double bed, a large wardrobe) and a day one (2 armchairs and a coffee table). The American style kitchen is well-equipped to cook and dine in. The yellow-painted bathroom includes lavatory hands, bathtub and shower fixture. Even if you stay just one night, you'll spend a nice time in here and you will discover a great Bucuresti accommodation. A desirable area, near Bucuresti Mall, a great complex with 70 stores (including a large supermarket), over 25 restaurants and cafes, 10-screen Hollywood Multiplex Bucharest Mall cinema, a bowling alley, a child-care center, a video games arcade, a public library. The parking area has over 1000 spaces, in a city where having any parking spaces specific for a commercial building is a novelty.